Increasingly, in legislative, regulatory and building code activities affecting construction, there is confusion over what constitutes a “resilient” product or material. Many industries claim to provide “resilient” products, with no clear definition of what that means. Additionally, many federal agencies have differing definitions and interpretations of “resiliency,” causing even greater confusion to designers, builders and those responsible for ensuring a safe building environment. The concept of resilience — the ability to withstand and recover — is not new. For the built environment, techniques to improve resilience have evolved over time and vary based on factors such as natural or man-made types of hazards, building occupancy, building importance, building location, and whether construction is new or existing. Some materials use “durability” as the main attribute to claim resilience. A survey of buildings demolished in the Minneapolis-St. Paul area found that wood buildings were typically the oldest. The majority of wood buildings were older than 75 years, but more than half the concrete buildings were just 26- to 50-years-old when demolished and 80 percent of the demolished steel buildings were less than 50-years-old. Overall, the fact that wood buildings had the longest lifespan shows that wood structural systems are fully capable of meeting a building’s longevity expectations. Modern wood construction meets today’s building codes. AWC’s engineered prescriptive guidelines exceed code, which is building for tomorrow. Newer research allows better prediction of forces from earthquakes, high wind, and fire, which also leads to inclusion of new performance criteria in codes and improvement to products. One of wood’s characteristics is that it can carry substantially greater maximum loads for short durations than for longer periods of time, as is the case during high wind and seismic events. As with seismic performance, the fact that wood buildings often have repetitive framing members attached with properly designed fasteners and connectors also helps to resist forces associated with high winds, as do diaphragms and shear walls made from wood structural panels properly attached to lumber, wall and roof framing. Wood was shown to be well suited for FEMA-approved safe rooms at the International Builders Show. 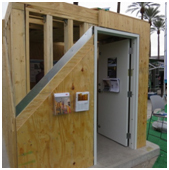 AWC demonstrated how wood can be used to build a “safe room” for refuge during natural disasters. FEMA safe-room requirements include passing a 250 mph wind test and a 100 mph “missile” test. The exhibit was spearheaded by the U.S. Federal Emergency Management Agency (FEMA), part of the Department of Homeland Security. AWC partnered with Simpson Strong Tie to build the wood safe room in accordance with FEMA prescriptive plans. The Trees and Timber Research Institute of Italy tested a full-scale seven-story CLT building on the world's largest shake table in Japan with excellent results. Even when subjected to severe earthquake simulation (magnitude of 7.2 and acceleration of 0.8 to 1.2 g), the structure showed no residual deformation after the test. The maximum inter-story drift was 1.5 inches and the maximum lateral deformation at the top of the building was just 11.3 inches. Watch a test on YouTube. APA-The Engineered Wood Association investigated the structural performance of modern homes constructed in the Dallas suburbs of Garland and Rowlett, Texas after a tornado event on Dec. 26, 2015. While it is challenging to design homes to withstand the higher force winds of an EF3, EF4, or EF5 tornado, there are cost-effective design details that builders and designers can implement to significantly mitigate storm damage, especially in extensive areas along the outer reaches of the storm’s path. Download the report here. Whatever the building material, there are two important aspects of flood-resistant design: elevating the building above the design flood elevation, and designing for increased loads associated with a building that’s higher off the ground. Wood building materials can be used to meet both aspects. For most wood products, minor strength and stiffness reductions due to wetting are fully reversible when the wood redries. Building codes establish risk associated with use, occupancy, and building height and area, regardless of materials, and wood buildings can be designed to meet rigorous standards for performance in a fire. In the context of resilience, where the focus is often on fires that occur in the aftermath of another disaster, such as earthquake, passive fire protection is especially important. Passive fire protection can be critical to containing a fire in the area of origin or slowing the spread of fire through the use of fire-resistant building elements such as fire-resistant floors and walls, and open space. The structural fire resistance of mass timber elements is enhanced by its large dimensions, slow burning, and build-up of char as an insulating layer. This fire resistance has long been standardized in the NDS, and includes a char calculation procedure to provide calculated fire resistance. The NDS was also expanded in 2015 to address the design of CLT buildings for structural and fire performance. Further study and full-scale tests continue to support expansion of mass timber’s applicability. For example, in association with a 13-story mass timber demonstration project (12 stories of CLT over one story of concrete), full-scale CLT fire tests were successfully completed by the provincial government of Quebec, Canada to prove CLT’s performance equivalence to two-hour-rated non-combustible construction. Some experts have proposed that resilience objectives in construction include the use of low carbon materials with low embodied energy, such as wood – which makes sense. Avoiding materials with large carbon footprints, in either initial construction or rebuilding following a disaster, would be a win-win for a resilient environment. Wood is the perfect green building material because it is renewable, reusable, stores carbon that reduces greenhouse gases, and is energy efficient. Reducing our country’s reliance on fossil fuels – and thus our greenhouse gas emissions – creates more resilient communities. The North American wood products industry is committed to sustainability in its products and their use. In support of this commitment, AWC joined the Canadian Wood Council (CWC) to produce third-party verified Environmental Product Declarations and Transparency Briefs that describe the environmental performance of many of the products we produce. AWC and CWC also partnered with Building Materials Reuse Association to develop an online North American directory outlining reuse and recycling options for wood and wood products. The website can be found at: ReuseWood.org. Then National Institute of Building Science issued a report on the benefits of investing in hazard mitigation. The Institute unveiled the Natural Hazard Mitigation Saves: 2018 Interim Report where their project team looked at the benefits of designing buildings to meet the 2018 International Residential Code (IRC) and 2018 International Building Code (IBC)—the model building codes developed by the International Code Council (ICC)—versus the prior generation of codes represented by 1990-era design and National Flood Insurance Program (NFIP) requirements. The project team found a national benefit of $11 for every $1 invested.